Imagine this scenario... A young child is playing in the yard when her pet dog bites her face. Bleeding, the child is rushed to the emergency room and the emergency room doctor offers to suture up the child's face. The next question a parent will probably ask (or demand) is the desire for a plastic surgeon to suture the face instead of the emergency room doctor. As such, the plastic surgeon is called in and sutures up the face beautifully. The plastic surgeon bills the family for $2,000 for services rendered in the emergency room. The plastic surgeon does NOT participate with their health insurance plan and being a non-participating provider, the bill for care provided is directly sent to the child's family. Here is a New York Times article describing this situation. Unfortunately, it is not unusual... and there are lawsuits now pending among insurance companies, specialist physicians, as well as even against patients regarding who pays the medical bills. Here is an article portraying a hand surgeon who has sued numerous patients regarding just this scenario. Most specialists will either write-off or accept any amount after being sent to collection. If a patient has a medical problem, a call to the medical office is made to see the doctor. However, before the appointment is made, both the patient and office checks to ensure the visit will be covered by insurance. If not, a call to a different medical office is made until one that participates with the patient's insurance is found. However, if the patient decides to see a physician who does NOT participate with his health insurance company, he will be responsible for the entire bill (the office visit will not be covered by insurance). The same is true for outside specialists called into the emergency room. These outside medical specialists participate only with certain insurances. As such, if they perform services on a patient whose health insurance does not cover that particular medical specialist, the patient will get the entire bill. 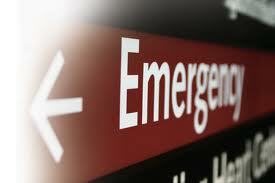 Emergency room care IS covered by insurance... because it is an "emergency," but services performed ONLY by the emergency room staff applies. NOT services by outside specialists called in. So what is a patient to do in order to avoid a surprising large bill? Ideally, have all services performed by emergency room staff and avoid services by outside specialists. If it is not life-threatening (like a facial dog-bite... ugly, but not life-threatening), have the emergency room doctor do all he can. Than follow-up as an outpatient with a specialist who participates with your health insurance plan. If an outside specialist MUST be called in, ask whether this specialist participates with your health insurance plan. If not, ask how much the specialist will charge for services rendered. Be aware, if the outside specialist actually comes into the hospital, a consultation fee will be charged (typically around $100-$200). If a procedure is performed, a procedure charge will be present (hundreds to thousands of dollars). A patient can request whether there is a different doctor who can be contacted should the specialist on-call not participate with his/her health insurance plan. However, be aware that typically only ONE doctor per specialty is on-call to the emergency room at any given time and as such, an alternative doctor may not be available. Once you are aware of the charges, you as the patient needs to decide whether to proceed with specialist care or not. Be aware that the insurance coverage issues also applies for specialist consultations during a hospitalization and not just in the emergency room. Simply going to the emergency room does not mean all medical services will be covered by insurance, especially services provided by a medical specialist. If specialist care is required in the emergency room, just ask whether the specialist participates with your health insurance plan, because if not, be aware that you directly will get a bill. That's just how the medical system is set up currently.